So, the time has come to update my GTM Tools. I released the first toolset in October 2014, and it performed its duties just well enough. Sure, the UI was ugly as hell, and there were bugs along the way, but for cloning containers, macros, and rules, and for visualizing containers, it was just good enough. I’ve been working on a new version of the toolset, designed specifically for accounts created in the new UI of Google Tag Manager. 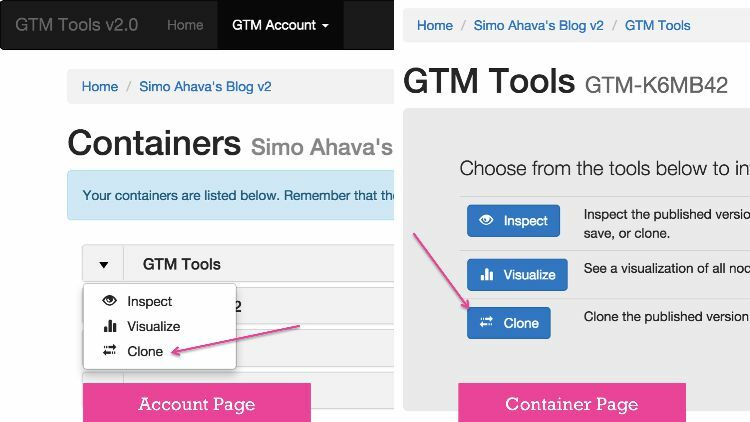 There’s no “backwards compatibility”, so this version of GTM Tools will, as I wrote, only work with accounts and containers created in the new UI. I am not a professional product developer, and GTM Tools v2.0 is not a commercial product. This toolset is my own, personal, intellectual property, with no purpose of making money out of it or making it the best possible product out there. It’s got bugs, the code is pretty nightmarish in some places, and I haven’t done thorough testing. It’s a toolset that you might find useful or then you might not. I would still appreciate that you e-mail me (simo(at)simoahava.com) any bugs, errors, or freezes that you come across. Just remember to check the Known Issues part of this guide first. 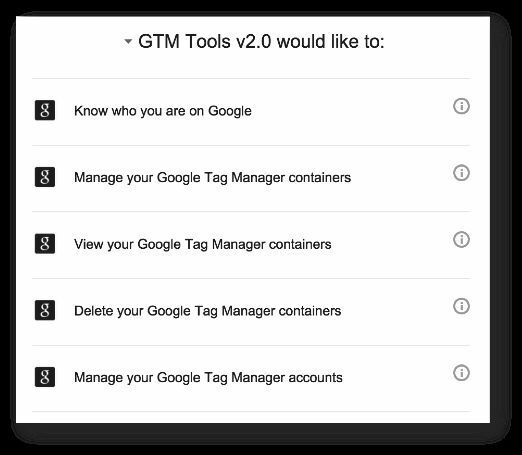 GTM Tools v2.0 uses your Google Account for authentication. This means that when you first open the tool website, you will need to Sign in with your Google credentials. Once you’re in the actual tool interface, you can see the profile you’ve logged in with in the upper right corner of the page. You can click this link and Sign out of your Google Account at any time, or you can click Account to access your Google Account settings. GTM Account – This lists all the GTM Accounts you have access to with the signed in Google Account. 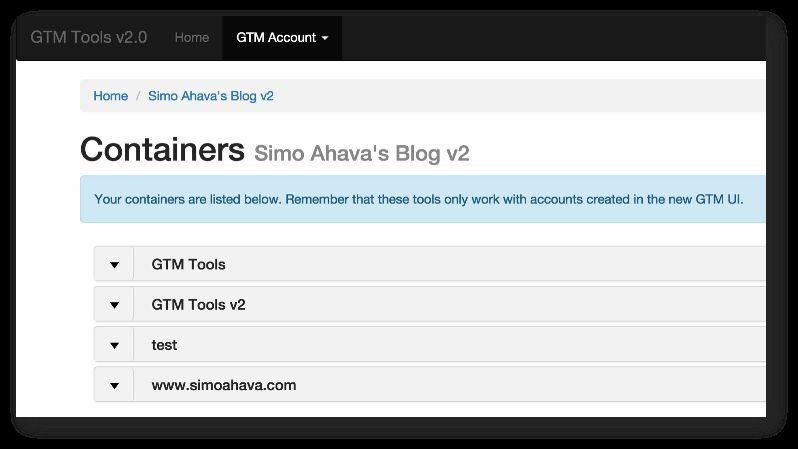 Note that this list includes GTM Accounts created for the old GTM interface, but these will not work in GTM Tools v2.0, so try to avoid accessing them. Your Profile – Clicking this shows a drop-down menu, where you can choose to access your Google Account settings and/or Sign Out of your Google Account. **NOTE! ** Due to processing reasons, you will only be able to interact with a **PUBLISHED VERSION** of any given Container. If there is no published version, you will not be able to perform any actions on the Container. This is something I intend to fix as soon as the API provides better access to the Container Draft. The container page is here more for structural reasons than to add any added value. 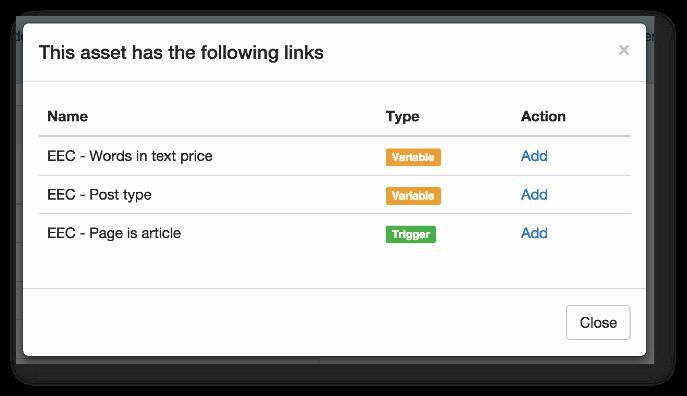 You can move through it to the individual actions (Inspect, Visualize, Clone), which you can also do from the Account page, as you just learned. 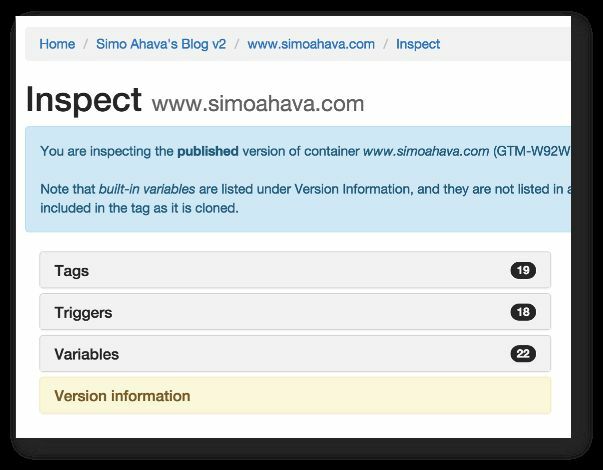 On the Inspect Container page, you can see a list of all Tags, Triggers, and Variables in a Container. You will also see information about the current published version by clicking the Version Information panel. The green plus will be greyed out if the asset is already in the Cart, and the red minus will be greyed out if the asset is not yet in the Cart. 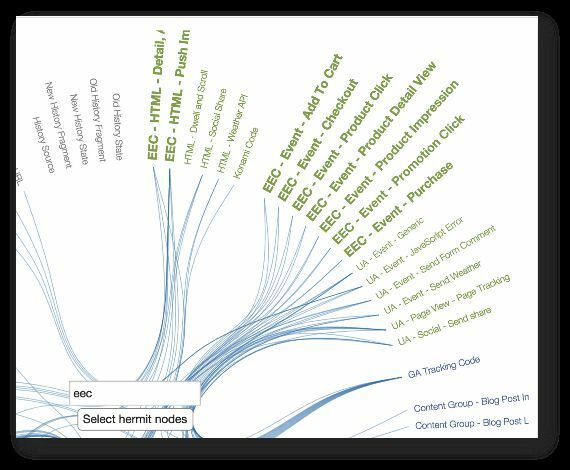 If there are no dependencies, you will only see a dash in the “Links” column. Do not add an asset to Cart if another asset with the same name has already been added. This is not supported by the current version of GTM Tools v2.0, and I haven’t yet prevented this in the code. 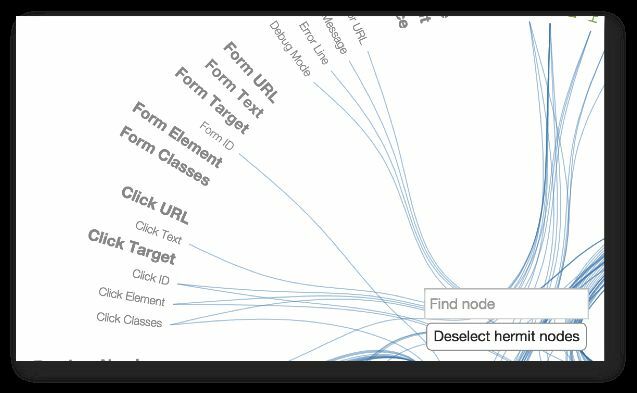 When you click on the yes button for dependencies, a modal dialog will open up which lists all the dependencies of the current asset. This means that these dependencies are linked to directly from the asset itself, or from one of the linked assets. 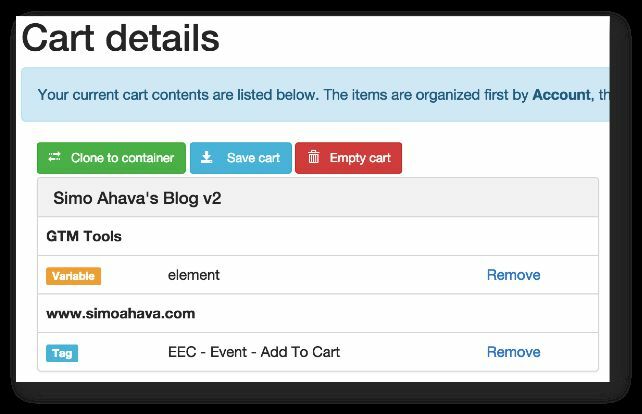 It’s strongly recommended that you include all linked dependencies when adding an asset to the Cart. 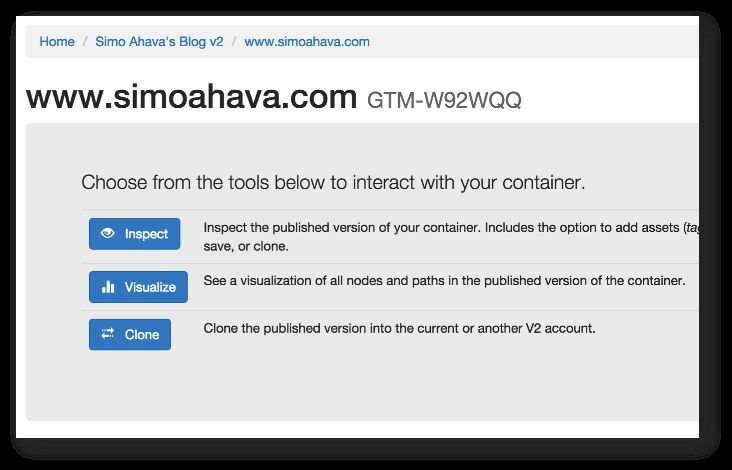 There are two ways to clone a Container in GTM Tools v2.0. Due to architectural reasons, they are a bit different. The first way is through the Account page and the Container page. So either you choose Clone Container from the drop-down menu next to the Container name in the Account page, or you click the Clone Button on the Container page itself. 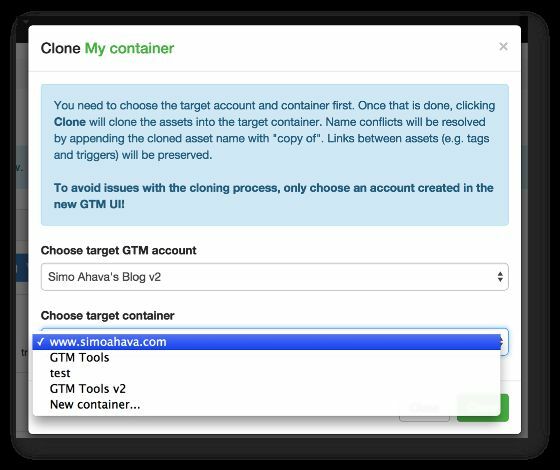 When you choose this Clone option, you will be able to choose the GTM Account where this Container will be cloned to. 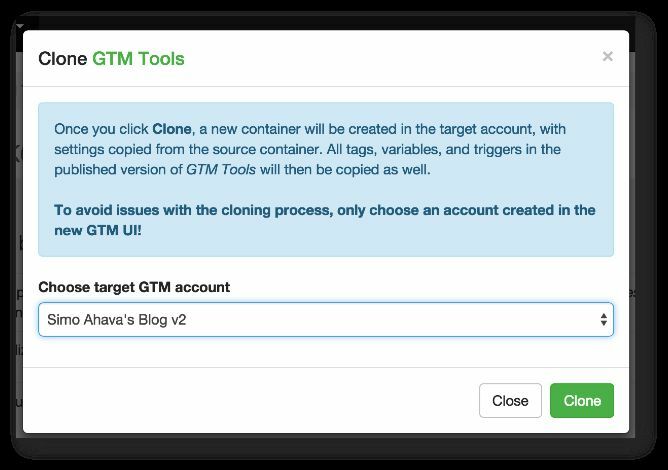 You can also choose the same GTM Account as the one from where you’re cloning the Container from. If you choose New Container, you will need to give the new Container a name. 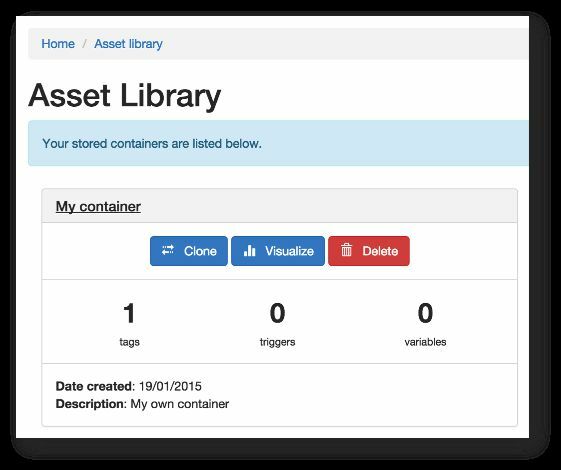 When you click Clone, the new Container will be created in the target Account, and all assets are cloned. If there is already a Container with this name, the new Container’s name will be prefixed with “copy of” during the process. 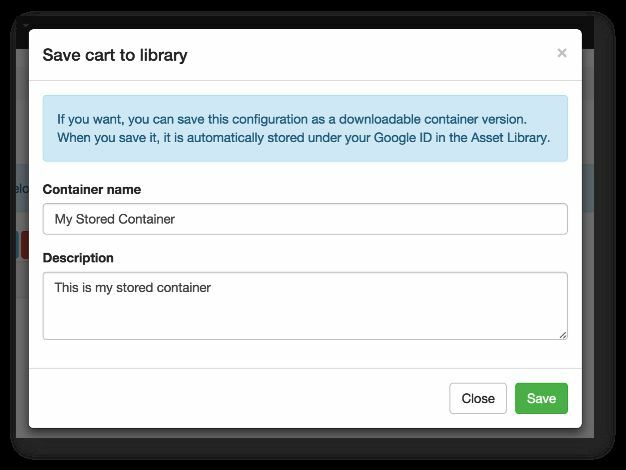 If you choose an existing Container, the contents in your Cart or in the stored Container will be merged with the assets in the target Container. This means that if there is a naming conflict, i.e. an asset with the same name already exists in the target Container, the asset’s name will be prefixed with “copy of”, and any links to the asset in other cloned assets will be updated accordingly. Once the Cloning process begins, there’s no way to interrupt it. 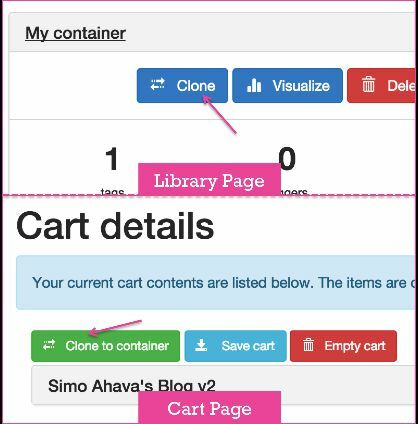 Clicking the Clone to container button opens a modal dialog that lets you clone the Cart contents into an existing Container or a new Container. The Library page shows you all your stored Containers. When you click a Container name, you will see how many Tags, Triggers, and Variables are in the stored Container. You’ll also be able to see when the Container was created, as well as the description you gave the Container when you saved it. If you try to access accounts created in the old version of GTM, you will run into trouble. Unfortunately, there’s no way to weed these out efficiently. This won’t be a problem after all accounts are migrated to the new GTM. 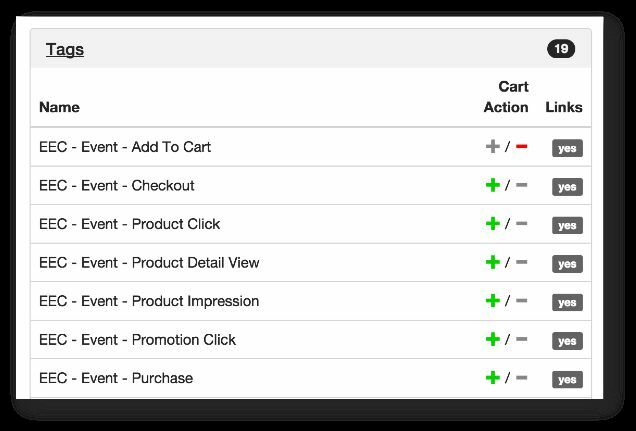 You can add an asset to the Cart even if another asset with the same name is already in the Cart. However, if you do so, you will run into an error when trying to clone the Container. I’m going to prevent this is the code, but it didn’t make it into this version. Currently, all Container actions work only with published versions of the Container. This is a limitation, and I hope to improve it as soon as the API provides better support for accessing the Container draft. At the very least, I intend to allow you to choose the version you want to interact with. Most common cause for errors is with naming conflicts. I’ve tried to fix most of these by automatically prepending “copy of “ in front of the Container or asset you’re trying to clone, but I may have missed some use cases. 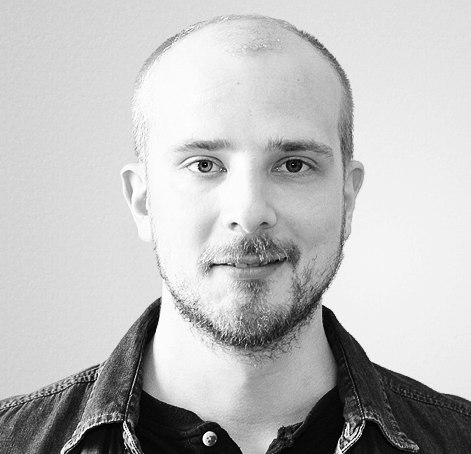 I cache most of the things you work with to reduce the number of API calls that are made. However, the cache is purged for Containers and assets whenever significant changes are made. Nevertheless, there might be situations where you don’t see a change even though you just performed an operation with the tools or did something in the GTM interface. In this case, I suggest you wait 15 minutes and then check again, as that is the expiration time for the cache. I will add a switch to manually flush your own cache, but it’s not in this version yet. Updated error handling to be more informative and less intrusive. Migrated from the Channel API to Firebase Realtime Database. As a result, the progress bar is slightly slower (working on it), but it’s more stable. Created a new container for Library storage since the first one was full. Sharding is done automatically. Minor refactoring here and there, but the codebase is still pretty awful. Migrated from cookies in Cart storage to AppEngine Datastore.